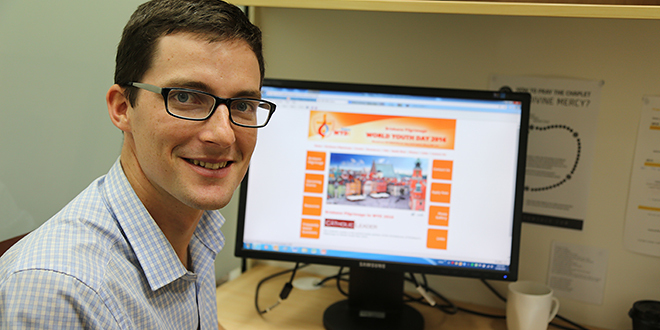 Poland pilgrimage: World Youth Day 2016 Brisbane liaison Zach Woodward invites pilgrims to come with him to Krakow next year. SAINT John Paul II will be at the heart of Brisbane’s World Youth Day pilgrimage to Krakow that will be officially launched this week. WYD 2016 Brisbane liaison Zach Woodward said pilgrims would walk the footsteps of St John Paul II, the WYD founder, to experience the week’s theme, Blessed are the merciful, for they will be shown mercy. Mr Woodward said he was excited to announce the approved itinerary for the WYD pilgrimage for July 14 – August 3, 2016 and the official website for interested pilgrims. “We took a lot of advice from people, including the official tour company (Cosmos) and some Polish contacts, including our local Polish priests, and the pilgrimage we’ve come up with is very exciting,” Mr Woodward said. “We’re excited that people can see day by day what we’re doing in the map and all the significant places we’re going to as well. “A lot of the sites we’re going to are places of pilgrimage, and people from all over the world go there on pilgrimage all year round, so to go there as the WYD pilgrimage is even more special. Brisbane pilgrims can expect to visit important places associated with St John Paul II’s life in Poland including pilgrimages to his birth town, settings of his favourite devotions including the Black Madonna, the hometown of St Maximilian Kolbe and St Faustina, plus various shrines loved by the saint. The 21-day pilgrimage also includes a week-long tour to some of Poland’s top tourist spots, then a visit to Second World War concentration camp Auschwitz, before pilgrims head to Krakow for the highly anticipated 31st World Youth Day week from July 26 to 31. Pilgrims will walk 14 kilometres to the final Mass location in Krakow. Mr Woodward said prayer would also be a crucial element of this pilgrimage, with a hope to pray the Divine Mercy chaplet daily at 3pm during the Polish visit. Formal compulsory formation ahead of the World Youth Day pilgrimage will begin in January. The pilgrimage will cost $5590 per person for twin share accommodation and return flights from Brisbane however prices are subject to change depending on pilgrim counts. Mr Woodward anticipated a full pilgrimage given it is hosted in the city from where St John Paul II, the patron and founder of World Youth Days, lived. “We’re hoping at least to fill a bus of 50,” Mr Woodward said. Mr Woodward encouraged university students to consider coming on the pilgrimage as semester holidays begin the week prior to WYD week. “Pilgrims will only miss one and a half weeks of university,” Mr Woodward said. Several Australian youth ministry coordinators visited Poland on a familiarisation tour and will provide the Brisbane archdiocese with a report to enhance the pilgrimage. The Brisbane WYD pilgrimage office will host an event to mark one year until WYD Krakow, with the date still being finalised. Applications for the WYD Krakow Brisbane pilgrimage will be open at www.wydbrisbane.org.au from July 1. The full itinerary can also be viewed there.